I'm not an expert on clothing, but I never see winter coats with good places to store your gloves. I'd like to think that some of my ideas are of the "Hey, that's a great idea, let me wake the neighbors and tell all about it" variety, but the fact is, the motive for a lot of my ideas is simply finding a better way to fix the things that bug me. This is one of them. The fact is, I hate the cold, so I tend to wear a big, puffy down parka from Lands End in the winter. 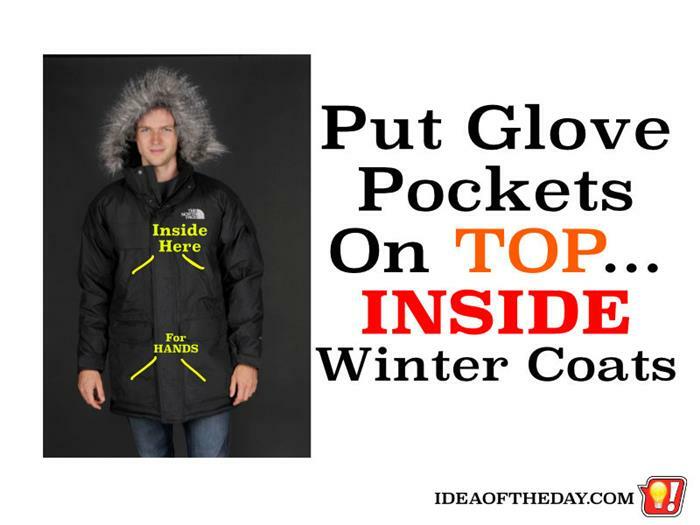 Like most Parkas, it has big oversized pockets at the bottom to put your gloves in.... plus pockets on the side of those pockets to put your hands in.